How do you light the inside of a windowless room? With a bottle of water, of course! Driven by the outrageous price of electricity in the Philippines, Illac Diaz developed this economical and environmentally-friendly alternative. And in just four months, more than 15,000 bottles have been installed. How does it work? Imagine cutting a hole in the roof. Light enters, but so does the rain. Now plug the hole with a bottle of water. Sure, the bottle allows light in and not the rain, but the sunlight entering the bottle refracts in the water, spreading out into the room below! See these water bottles in action here. Originating in the elaborate courts of the Italian Renaissance in the 1400s, it developed into an art form during the 17th century in France under the reign of Louis XIV. But the elegant arabesques, exhilarating grand jetés, and energetic fouettés en tournant of ballet that we know today grew out of the Romanticism of the late 1800s, when ballerinas portrayed fairy-like creatures and almost seemed capable of floating in the air. Have you ever wondered how a dancer can seem to defy gravity while your own feet are so firmly planted on the ground? Let’s take a closer look at gravity and discover the secrets behind some of these beautiful movements. An article about dance should make you move, right? Here’s an experiment. Stand against a wall with your heels touching the wall. Now bend over and touch your toes. Did you make it? Why did it suddenly become so difficult to do this simple task? The problem is the location of your center of mass: the average location of all the matter in your body. When standing straight, your center of mass lies within your body just below your belly button. It is situated above your feet, so you have no trouble standing. But your center of mass can move depending on the position of your limbs. What if your body is horizontal? In a pas de deux, a male dancer may lift a ballerina into the air. Have you ever noticed where his hands are placed? Rather than clasping her waist or her thighs, he clasps her hips. Not only do her hipbones provide support, this is the point where her body is balanced; this is the location of her center of mass. Any closer to her belly or her thighs and the balance is upset; her center of mass is no longer above him, and he won’t be able to hold her aloft. If your body is not straight, however, your center of mass is different. Try the experiment again. What happens to your center of mass as you bend over? By moving your torso away from the wall, you move some of your mass forward. Your center of mass also moves forward to a point somewhere in front of your upper thighs, not inside your body! Continue bending forward and at some point it will have moved out beyond your toes and you risk falling over. What do you do to keep from landing face-first on the floor? Try it and see. Can you figure out why standing against the wall makes such a difference? 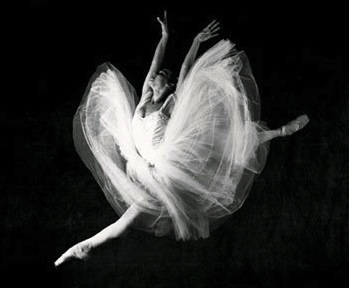 Dancers instinctively know that to execute a perfect turn, their center of mass needs to be over their feet. Imagine trying to execute a turn, like a pirouette, on one foot. What happens if your center of mass is not directly over your feet? You end up with a wobbly turn, or worse, falling over! The center of mass also helps explain those big leaps, or grands jetés, that seem to hang effortlessly in the air. 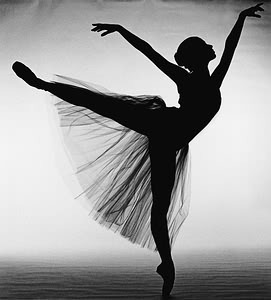 After taking a few quick steps, a dancer takes a leap, one leg leading and one trailing. During the leap her head rises a certain amount. (For some numbers and more physics, check out Dr. George Gollin’s Physics of Dance website.) As soon as she starts the leap, however, she raises her legs, i.e. some mass, to be parallel to the floor, which raises her center of mass some more. During the jump, her center of mass rises more than her head, making the leap seem even higher. What is more, her center of mass moves the most at the very beginning and end of the jump; it moves very little through most of the leap, giving the impression she is hanging in the air or floating. We are so familiar with gravity’s pull attaching us to the ground that the light airy movements in ballet take us by surprise. The movements seem much more possible, however, when we apply a little physics and see how ballet has developed to work with gravity. The result? An art form that becomes even more exquisite! PS. Here is another experiment. Sit in a chair, with your knees at a 90° angle, your feet flat on the floor. Now stand up without moving your feet or bending forward. How did you do? Our natural instinct is to bend forward, but try it again, without bending forward! When you sit in a chair, your center of mass lies at a point above your thighs in front of your lower belly. It is impossible to stand up in the second experiment unless you move your center of mass closer to your feet, which is what happens when you bend forward. As part of the Apollo program, United States astronauts (one was also a geologist) walked on the Moon six times between 1969 and 1972, the only times humans have set foot on another celestial body. Will we ever return? As the BBC describes, NASA has released high-resolution images of the Apollo landing sites, all located on the near side of the Moon. The Lunar Reconnaissance Orbiter Camera has been orbiting the Moon since 2009 at an average altitude of 31 mi (50 km) to gain information about potential future landing sites, and was able to move into an orbit bringing it just 13 mi (21 km) above the surface. Think the astronauts left the Moon in pristine condition? The pictures reveal tire tracks, astronaut boot prints, and discarded pieces of equipment. Share your thoughts: Would you go to the Moon if you had the chance? You are currently browsing the Daily Science blog archives for September, 2011.